Have any of you ever seen the 1955 film Love Is a Many-Splendored Thing? It stars the late William Holden as a war correspondent covering the Korean War. He also happens to be married but estranged from his wife, who is in the U.S. 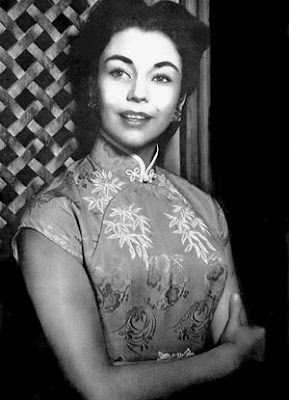 It also stars the now late Jennifer Jones, who plays a "Eurasian" doctor, Han Suyin. I put "Eurasian" in quotation marks because no one uses that term anymore, although it was quite popular (and more politic) back in the days. Now, we'd just say she is mixed-race--the daughter of a Chinese/Cantonese man and a British-white woman. The film is actually based on the memoir of Dr. Han Suyin--I'm sure that the romance between her and William Holden's character is really played up for dramatic purposes, but I've never read the memoir. I begin with the film because Ms. Jones is my namesake. My mother LOVED (or maybe it should be the present tense LOVES) this film. And while "Jennifer" was the most popular name the year I was born (most folks either blame it on the film version of Camelot--Jennifer is a derivation from Guenivere or on the film Love Story--the tragic protagonist is named "Jenny"). And last week, on December 17, 2009 Jennifer Jones died of natural causes in her Malibu home at the age of 90. I've always thought it was funny that I am named after a white actress who famously played the role of a mixed-race Asian woman. That a woman acting in yellowface essentially propelled my name into the world and that I ended up being someone who critiques yellowface and writes about issues of mixed race. Anyway, rest in peace Jennifer Jones. I feel an odd sense of kinship and connection to you. And I must admit, I also have a certain fondness for this film...even though I wish they could have found someone who was actually Chinese or mixed-race Asian to play the lead. Racism + Environment = Environmental racism? This story just out of the AP: as the globe warms and waters rise, there are going to be thousands if not millions of people displaced from the coast. And as this story demonstrates, a history of racism and discrimination makes trying to sort out the environmental impacts and to provide aid more difficult since aid continues to look like discrimination. This is a lengthy piece, but I think it's worth reading to demonstrate the complexities of racism, historic and unremitting racism against a group of people whose links to the land extend back millenia--and whose mixed-race lineage also reminds us that purity really is a myth. "La. Indian village holds out against plea to move"
ISLE DE JEAN CHARLES, La. (AP) — A day in the life of Edison Dardar starts with a caterwaul of a shout. A yawlp. His chest puffs up: "Yay-hoooo!" Morning cries down the road greet him. "Wa-hoooo!" .... "Yaaaah!" .... "Aaaahh-eee." The Indian fisherman smiles. His cousins and nephews are doing well. Soon enough, roosters and dogs join the morning chorus, and the island is awake. "It keeps your chest clear," the 60-year-old barrel-chested fisherman rationalizes. "Over in Bourg, if I did that, they'd probably put me in jail." Bourg is a tidy Cajun bayou town a few miles north of Dardar's hurricane-smashed Indian village in the marsh where holdout families are being urged to move to by a tribal chief, scientists and public officials. Why? Because life on this spit of soggy land 6 miles from the Gulf of the Mexico may soon be impossible for the interrelated families with French, Choctaw, Houma, Biloxi and Chitimacha bloodlines that go back 170 years when a Frenchman came here with his Choctaw wife and named the island after his father, Jean Charles. The road to the island is caving in. Hurricanes are flooding homes more often. The Gulf gets closer every year. Isle de Jean Charles is at risk of disappearing under the Gulf of Mexico. But to Edison Dardar and his kin, the name Bourg sounds like a prison. "What am I going to do there? Wake up and look at the road?" Edison Dardar shrugs. "No, not me. I'm not moving. This island is more beautiful than ever. This island is a gold mine for me." He casts for shrimp at sunset behind his house. Sips coffee at Oxcelia's, his sister's place up the road, in the mornings. Checks in on Leodilla, his blind, 90-year-old mother who's old enough to remember the huts made of mud and grass, or bousillage. His wife, Elizabeth, is content watching old Westerns like "Bonanza" and feeding her chicks. A son still lives at a home they raised on 12-foot stilts after Hurricane Andrew in 1992 flooded the island. It wobbles like Jell-o when someone walks from one room to the next. With a bad limp from 40 years of backbreaking work dredging for oysters, Edison Dardar hobbles over to a handmade plywood sign on the road through the village. He stands next to it proudly. It reads: "Island is not for sale. If you don't like the island stay off. Don't give up fight for you rights. It's worth saving. Edison Dardar Jr."
"My son wrote it," Dardar, who cannot read and write himself, says with a grin. From New Orleans, it's a long road to this alligator- and mosquito-infested marsh island. The road goes past the city's outskirts, postwar suburbs and po' boy sandwich shops; it sails across Cajun farmlands of sugar cane fields, moss-draped oaks and roadside watermelon vendors. You must drive beyond the inland fishing towns connected by clunky drawbridges and bayous bobbing with shrimp trawlers and hyacinth. Push on, and the canopy thins out, the road crosses a levee and enters the wide open expanse of marsh tidelands that run for miles out to the Gulf of Mexico. An end-of-the-world nausea sets in on the narrow road that rolls across open water toward Isle de Jean Charles. A crooked yellow sign warns: "Water On Road." When high tides and a stiff southern wind combine, the road is slick with water. Half the road caved in after last year's hurricane season. A gut check hits as the road wends through the island. Half the houses are empty shells, blown apart by hurricanes. Most of the others are raised high on pilings — not for the view, but to keep sofas, beds and Grandma's photos out of the Gulf's regular inundations. The church is gone, the store is gone, most of the children too. The islanders are living the doomsday scenario that many researchers say awaits Miami, Houston, Savannah, New York: A rising sea at the doorstep. The village sits outside the main levee systems of south Louisiana, and in the middle of some of the fastest eroding wetlands in the world. For the past 80 years, oil drilling, logging and the Army Corps of Engineers' levee building on the Mississippi River have doomed the island. The knockout is the combination of sea level rise and intense hurricanes. "In the 1980s, I asked someone to take me to look at Fala, an important Indian settlement, and he took me out there in a boat and said, 'Look down,'" recalled Jack Campisi, an anthropologist who's worked to get south Louisiana's American Indians recognized by the federal government. So far, the Bureau of Indian Affairs has shot down their petitions. "What's at stake is a viable ethnic identity. It's easier to do if you have a federal relationship." Many tribes moved into the swamps to escape enslavement or forced banishment after Congress passed the 1830 Indian Removal Act. Today, there are about 20,000 American Indians on the coast. Until the 1950s, most Indians lived in isolation with limited interaction with whites. Old timers recall barefoot children scampering into the woods to hide when the first cars rattled onto the island in the 1950s. Before the coast was overrun by the oil boom and shipyards, the Indians lived off the land, growing small gardens and raising livestock. Fish, oysters, crawfish and crabs were staples. For medicine, they relied on plants. There was "bon blanc" tea made from a leafy plant. Medicinal teas were gotten from boiling "citronelle," ''venera," a Houma word for sage, and the bark of the "bois connu" tree. "We had no running water. We washed our clothes in the bayou," recalled Hilda Naquin, a 95-year-old Houma woman who grew up between mud walls covered in newspapers and under a thatched palmetto roof. "We didn't have much to eat. My grandpa used to plant a garden. Thank God for that. Our oven was made outside with the dirt and mud." This isolation was imposed, as stories of discrimination attest. Indian children were barred from schools until the 1960s and called "sabines," a derogatory term. "My daddy couldn't go get a haircut up the bayou. He couldn't get a hamburger in the town of Golden Meadow," said Laura Billiot, Hilda Naquin's daughter. "The prejudices are still there today; not as bad, but they're still there." Albert Naquin, one of two tribal chiefs recognized by the islanders, stands on the sinking road surveying his old village. The sound of water laps at the road and fills the silences between his words. "They had a small lake over yonder, just north of here. Wonder Lake. Now it's all open water," Naquin says. He resembles a defeated general surveying a battlefield. The contours of the past — smoke rising from thatched-roof homes, barefoot children splashing in crawfish ponds, fishermen poking through the marshes in pirogues — shimmer on the flat marsh horizon in front of him. But these are only memories now. For him, it's time to move inland and reconstitute the tribe behind the safety of levees. "We didn't have any money. We lived off the land. We had our own cows, we had our pigs, we had chickens, and they were fishermen, and they also raised the garden. So, during the Depression, we didn't even feel that at all," Naquin says. The idea of moving to Bourg was Albert Naquin's idea. He's talking with state and federal officials about a $12 million plan to buy a tract of land for 60 homes, in return for not fixing the road. But his intentions are regarded with skepticism and open hostility by the families that remain on the island. Naquin's family moved off the island after a hurricane destroyed their home in the 1970s. "Sometimes I feel like Moses," he says. "But Moses had something to go by. I don't have anything. I mean, I'm just an old Indian guy from down here." He shakes his head. "I'm taking a beating." Isle de Jean Charles is not the first Indian village to face relocation because of erosion and sea level rise. These factors are combining to force the relocation of seaside villages like Newtok, Shishmaref, Unalakleet and Kivalina in Alaska. "This is not something that is happening just in Louisiana and it is not something that is theoretical," said Robert Young, the director of the Program for the Study of Developed Shorelines at Western Carolina University in Cullowhee, N.C. "If we don't at least talk about relocation, nature will make those decisions for us, and they won't necessarily be the ones we want to make." Since Hurricane Katrina, Louisiana officials and the Army Corps of Engineers have set about drawing lines across south Louisiana to determine what can and cannot be saved from sea level rise and delta erosion. "They drew this broad red line, and said the entire area below the red line would be at risk," said Michael Dardar, a diesel mechanic, tribal historian and a leader with the United Houma Nation. "Every major Houma community is below that red line. Lower Dulac, Pointe Aux Chenes, Isle de Jean Charles. Our whole way of life is in danger." This bleak future has been the topic of a recent series of community meetings, called "How Safe, How Soon?" "We need to make sure that we can adapt, whether it's elevating our homes, building smart or moving to a different location. Our history's important, our culture's important and preserving our communities is important." Isle de Jean Charles may be on the wrong side of the line being drawn across the map of south Louisiana. But defiance here seems immovable. The Dardars, Naquins, Billiots and Verdins aren't going easily. "I wouldn't move. No way. I don't care if this place floods time and again. Nobody but me is living on this land," says T.J. Dardar, a fisherman and one of Edison's cousins, squatting outside his dilapidated wooden house. It's missing siding, needs a coat of paint; piles of beer cans, burnt trash and assorted junk lie around it. A heap of asphalt shingles, with a couple of television boxes thrown in, slumps into the canal across the road. Notwithstanding the flooding, dangerous road and declining sense of community, it's not hard to see why people want to stay. "You can do anything you want on this island — catch your crabs, your shrimp, dry your shrimp," Edison Dardar says. "I see nothing changed, me," he says on a walk through his village. So what, he says, if there is now water where he once saw grass? "We were killing duck (when there was land). Now we're killing shrimp. If you're hungry, you make a living." Back home, his tangy shrimp are drying on a tarp behind his house. Chickens squawk. He mashes a piece of shrimp between his teeth. "They still need to dry some more." Time slows down here. The plop of a fish brings a great silence of the marsh. Dardar rests for a moment and the symphony of frogs, bugs and birds comes back. "Make some good gumbo, jambalaya. Talk about good, partner." "Leave? For what?" he says. Last night while channel surfing through cable tv (Oh, how I miss my Sunday Mad Men nights) I saw a commercial from Philadelphia cream cheese in which an African American woman--in her mid-20s, hip, young and fashionable, and attractive is making spaghetti with marinara sauce, stirring in a tub of Philadelphia cream cheese. We also see a white man (also mid-20s, young, hip, attractive) enter the frame, who is helping her with the meal--setting the table and adding things to the pot. The music playing is one that you typically hear with these kinds of ads, soft-rock-jazzy-peppy. The couple are affectionate with each other and are framed close together, sharing in the fun of cooking this meal, sitting down to eat it, and then afterwards, dancing in each others' arms and sharing a close-up kiss before the commercial ends. The commercial is not long--I mean, it's the typical length of a commercial (15-20 seconds), but it's probably the first time I've seen an inter-racial black-white couple acting ... like a couple. Sometimes you see groups of "friends" who could also be "couples" and they are a mixed-race group, but it's not quite clear if they are romantically linked or even sometimes who is with whom (after all, even though there are 2 women and 2 men, the men could be with one another and the women could be paired as well--although who am I kidding--this is mainstream advertising--they do not want us to assume queer coupling, but I think it's interesting to consider this possibility!). Anyway, I was struck by this commercial--because I can't recall seeing another young, attractive, affectionate, hip 20-something black-female, white-male inter-racial couple in a commercial for something as mundane as cream cheese. In fact, it made me think about the dearth of inter-racial couples who really SEEM like couples--who act like couples. All those ads for KY jelly or for Visa or for the hundreds of other mundane products and stores seem to show Asian couples/families and Latino couples/families (rare but we're starting to see them), black couples/families (a bit more visible), and white couples/families (yep, they are all over the place and hence "the norm"). If we're heading into the second decade of the 21st century, shouldn't being a mixed-race couple and especially a mixed-race family be a bit more visible and commonplace than in just this one Philadelphia cream cheese ad? And shouldn't this couple be eating healthier??!! Yesterday evening, right before 5pm, I was driving home after spending a lovely afternoon having tea and catching up with an old friend. As I pulled into a major intersection, before heading the the highway, I looked up in the sky to see this HUMONGOUS flock of birds--I'm not a birder so I don't know what kind they were, but I'd guess some kind of lark or starling or swallow--a small bird who has been known to swarm. Because really, that's what they were doing--hundreds upon hundreds of these birds were flying together, flowing and undulating in odd patterns, but all the while hovering above the sky of the intersection--seemingly to land on a large tree in a corner lot. The light was blessedly long--not something I normally say or feel when waiting at an intersection, but I was enraptured by the image of these birds dancing in the sky, circling and circling against the setting sun. It was beautiful. A random and unexpected moment of pure pleasure. I offer this to you because it reminded me that we don't often take the time to contemplate pure beauty when it's in front of us. And that this kind of pure beauty can happen in the most unexpected of places--like an intersection in the middle of traffic. It is a good reminder that we should be open to these moments that can take our breath away and make us smile with childish delight. Can we let Tiger be Tiger? Should we? I've debated about whether to blog about Tiger Woods and the recent mishap that he had with his car hitting the tree and fire hydrant at 2am, the reporting in various tabloids and magazines about women claiming to have had affairs (or denying affairs) with him, and the statement on his website apologizing for "trangressions" he has made and his statement that like the rest of us, he is human and has flaws and would appreciate some privacy in this matter. I have written in the past about Tiger--about how he is not solely responsible for whether or not there are more black golfers on the PGA and in a post titled "Let Tiger be Tiger." But can we let Tiger be Tiger? In other words, should we, the larger public, respect his need for privacy--ignore the hype in the tabloids, switch the channel on CNN, ESPN, every major news outlet when they carry something about his alleged affairs or his car accident or anything else related to Tiger outside of his golf swing? How much scrutiny, how much judgment should we be leveling at Tiger in the court of public opinion? How much of this matters to the readers of a blog called "Mixed Race America," beyond the fact that its author is a golfer, a Tiger Woods fan, and sees him as the subject for one of her book chapters? I can't really speak on anyone else's behalf but my own, so let me see if I can sort this out here. There is a part of me, the anti-racist educator and activist part of me, who has long wanted Tiger to be SO MUCH MORE than he seems to be--who has wanted Tiger to be a spokesman for social justice and racial equality. That every time he accepts an endorsement from a major corporate sponsor like Gatorade or Nike or Buick, that he insists on a little PSA talking about anti-racism or anti-sexism or anti-homophobia--and the ways that golf can turn its image around as an elitist country club sport and be inclusive for everyone, including working-class kids. It's a pipe dream, I know--a true fantasy. And in some ways, unfair to expect the golfer of color to be the one who is going to speak truth to power when we all know we need allies of all races to step up to the plate. But none-the-less, I like many others, want Tiger to be something more than he is--a flawed human being. And in many ways, because of how ubiquitous he is in mass and popular culture--all those t.v. ads that show him as a super-human being, and all those golf tournaments in which he defied the laws of physics and the averages--winning more championships than anyone else currently playing (and perhaps, projected into the future--more than any other golfer in our lifetime)--he seems to be a super human being. Plus he seems to also care about certain causes--namely education. Setting up learning centers for kids who are largely working class and racial minorities to help them get up to speed in math and science and all those Tiger Woods golf clinics helping working class kids, especially girls and racial minorities, see golf as a path for excellence in their larger lives. He seems to care about kids--to be a rolemodel for kids. So how do we reconcile the news that he has clay feet--that the evidence for him cheating on his wife and family appears damning--that he is not the super human being that he is portrayed to be? Perhaps what Tiger offers is an object lesson, as a recent New York Times article titled "Woods as Inadvertent Educator: Choices Matter" indicates. I think what we can learn from Tiger Woods is that he is human and has made mistakes--not just the allegations of infidelity, not just the accident with his Escalade--but there are countless flaws and failings that he must have, that we do not see, or that we do see but overlook because we want Tiger to be this perfect super-human role model. But maybe the best rolemodels are the ones who admit they are human--who admit their mistakes, apologize, and then go on and learn from them. Because that's what it means to really succeed. Not that you never fail, but that in your lowest moment, how do you pick yourself up, dust yourself off, apologize to any you have harmed, make genuine amends, and then move forward? How do you recover from an "F" on an exam? From your parents' divorce? From racist comments made by fellow students...from a teacher...from yourself--racist comments YOU have made towards others? How do we admit our mistakes and failings and grow from them? Yes, I'm disappointed to find out that Tiger may have cheated on his wife--multiple times. It suggests a moral frailty and vanity and arrogance that doesn't sit well with me. On the other hand, I have my own frailities, vanities, and arrogances. I do want Tiger to be better than what he seems to be, if only because I want him to be that super-human rolemodel, as unfair as it is--but like everyone else in the world, I need to remember that my desire for him to be this symbol ignores the reality of who he is--and what I'll be waiting and watching for is how he handles himself in the next few months and years. We all deserve a level of compassion--Tiger may not be able to ask for less scrutiny as a public figure, and we can condemn him for his moral failings, but I think that as a figure who seems to genuinely want to make a difference in children's lives, we should also allow him a measure of compassion. And I'm not going to stop hoping that one day he will step up as that Mixed Race American spokesperson who champions issues of social justice. Yes, I can dream.